The Goddess Party is a sacred circle for women, it is a playful and profound experience in which we delve into our connection as women by celebrating our friendships, the women we came from (our mothers and grandmothers), and each others uniqueness, wisdom and humor. We indulge in delicious foods, discuss womens sacred mysteries, Goddess mythology, relationships, health, sexuality, goals and more. During the Goddess Party we create a special ritual to honor our wisdom, beauty, love, connection, playfulness and power as women. A Goddess Party is an invitation to be infused with the beauty we all share. 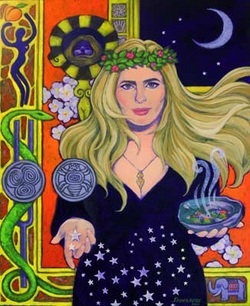 It is a fresh, magical and unique way to honor a woman's life, friendships, and the distinctive qualities common to all women. Any occasion in a Woman's life is a wonderful reason to have a Goddess Party. The Goddess Party is a celebration and a rite of passage experience for women of all ages. Perfect for: birthdays, bachelorette and bridal showers, womens support groups, book clubs, spiritual awakenings and a Girls Night Out. It is a wonderful rite of passage experience for Girls too. illness/cancer, divorce, grief/loss, empty nest syndrome and other profound or significant changes in their lives. The Goddess Bride is a unique celebration for the 'Bride to Be'. The Goddess Bride is a ceremony that honors the Bride and her close circle of female friends, bonding them as women in a beautiful, loving and supportive way. It is a special gift for the Bride - to be blessed, loved and supported by her closest circle of women as she steps forward into her new life. The Goddess Bride is an ancient type of ceremony brought to the 21st century to be acknowledged and enjoyed by every Bride. You will laugh, you will cry and you will enjoy every moment of this sacred experience. Contact me today and receive a special offer for your party.